Sunflower Education is a Texas based publisher creating who creates educational based materials for teachers, parents and students. Currently they offer a variety of fun science, social studies and language arts materials available. We received a digital copy of Amazing World Records of History thanks to Sunflower Education & Educents to review. 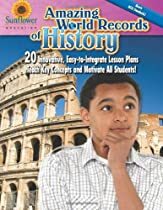 This 124 page book includes 20 easy to use lesson plans to teach history by utilizing fun world records which are sure to spark interest for any child! RECORDS are pretty cool things to explore! Did you know....that the largest city is Tokyo-Yokohama, Japan? Or that the most widely read book is the Bible? What about that the largest school is City Montessori School in Lucknow, India? Well you will learn about these and much more in this book. 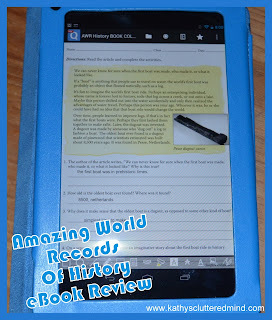 The Amazing World Records of History book is designed for grades 5th-9th however it can easily be tailored for the younger grade levels. It is aligned with the National Council of Social Studies Standards and includes everything you need: teaching tips, lesson plan, 60 reproducible activity sheets, answer key and more. Throughout this book children will learn a fun historical fact and then complete fun activities to dig deeper. For example children will learn about the world's deadliest battle (The Battle of Stalingrad, WWII) then through the provide activity sheets they will continue to learn more about the battle (dates, death toll, location, etc), how to read a battle map and they will even do research on another battle of their choosing. Each lesson broken into several sections to make them very easy to use. Very little preparation is needed for the flexible lessons which makes them great for busy homeschool moms like me. I used the eBook on my Android tablet and we were even able to complete many of the worksheets on the tablet as well. Here is how you can use the eBook and worksheets on a tablet: Save the file to Drop Box App and then open it on your Android tablet using an app like qPDF. This app allows you to make edits directly on the pdf and save them as well. This set up made it very easy for us to use the eBook on the go! Chapters - each chapter address a particular record. There is a teachers page for each lesson which provides NCSS Themes, Time Required, Teaching Tips, Answers and Extension and Enrichment activities. Student Activity Sheets (3 for each lesson) - the 1st activity sheet introduces the world record. The next two activity sheets vary in format, content and student activity. They will generally expand on the record and will introduce children to larger topics. The activity sheets are fabulous and provide great opportunities to engage broader and deeper awareness of historical facts. This book is a fabulous resource for both parents and teachers. It can be used in classrooms, homeschools, camps, etc. The book can also be used as a field trip enhancement tool. For example the World's Oldest Boat lesson discusses a Pinewood Dugout boat made about 8,500 years ago. It just so happens one of our local museums has one of these boats. So a fieldtrip to a battlefield, art museum, history museum, etc can really enhance the lessons in this book. It is a FUN learning aid/supplement for children of all ages (and even adults). We had so much fun learning history together as a family. And there are so many other subjects besides history covered in this book including art, geography, history, science and more. There are 5 Amazing World Records books available including Amazing World Records of History, Amazing World Records of Geography, Amazing World Records of Weather, Amazing World Records of Language and Literature and Amazing World Records of Science and Technology. Sunflower Education has even put together some awesome FREE resources for each of the books like this Historical Google Interactive Map which includes pins for all the various places where historical facts included in the book took place. There are also great images too for each fact too. A great way to teach history! Capture students' imagination with a jaw-dropping world record and then build on that interest to teach core ideas. For example, a lesson on the world's oldest city (it's 12,000 years old—and people still live there!) leads to activities about where people choose to build cities and why, and an in-depth look at students’ own community. Students research how boats changed history, read cunefiform, map the Columbian Exchange, explore linguistic diversity, and conduct dozens of other high-interest activities. ENGAGING - When we were kids, we dreamed of seeing the biggest, the best, and the greatest things the world had to offer. Kids today are no different. The Amazing World Records books leverage their natural interest in world records to stimulate learning. PEDAGOGY - Fascination with extremes is a natural stage of cognitive development—and a golden opportunity to teach. CONTENT - High-interest topics and high-value learning - 20 world records in each! VARIETY - A wonderful variety that maintains student interest. PROVEN - Purpose-built to use kids’ keen interest in extremes to help them comprehend their world. The world record grabs their attention, and follow-up activities provide vital learning. We had fun learning fun facts. We learned about boats and old cities. We drew boats, looked at pictures of boats and learned about Netherlands country. We also learned about old places. We learned the oldest city is Damascus and that people have lived there for the last 4,000 yrs. All of the Amazing World Record books will be offered as a bundle on Educents starting 7/15 and going through the 25th. The PDF's will be offered at 50% OFF ($42.50) and the shipped hardcopy books will be offered at 30%OFF ($59.00 with free shipping). If you miss the Educents deal you can buy The Amazing World Records book on the Sunflower Education Website or Amazon! • ENGAGING - When we were kids, we dreamed of seeing the biggest, the best, and the greatest things the world had to offer. Kids today are no different. The Amazing World Records books leverage their natural interest in world records to stimulate learning. • PEDAGOGY - Fascination with extremes is a natural stage of cognitive development—and a golden opportunity to teach. • CONTENT - High-interest topics and high-value learning - 20 world records in each! • VARIETY - A wonderful variety that maintains student interest. • ENGAGING - When we were kids, wd of seeing the biggest, the best, and the greatest things the world had to offer. Kids today are no different. The Amazing World Records books leverage their natural interest in world records to stimulate learning. • PEDAGOGY - Fascination with extremes is a natural stagee dreame of cognitive development—and a golden opportunity to teach. • PROVEN - Purpose-built to use kids’ keen interest in extremes to help them comprehend their world. The world record grabs their attention, and follow-up activities provide vital learning.